Save money and improve your homes overall performance by taking certain cost effective measures. There are a large number of ways to cut energy costs in your home. It doesn’t take piles of money and expert know how to reduce energy costs yourself. 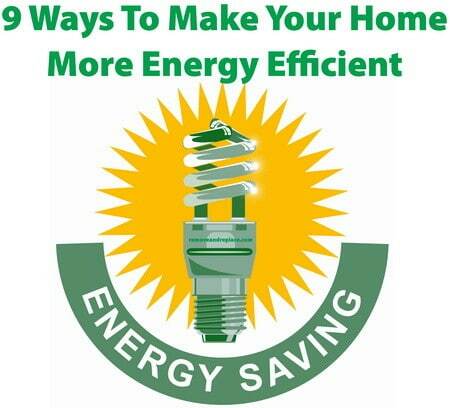 Doing simple and inexpensive methods can save you thousands of dollars a year in energy costs. 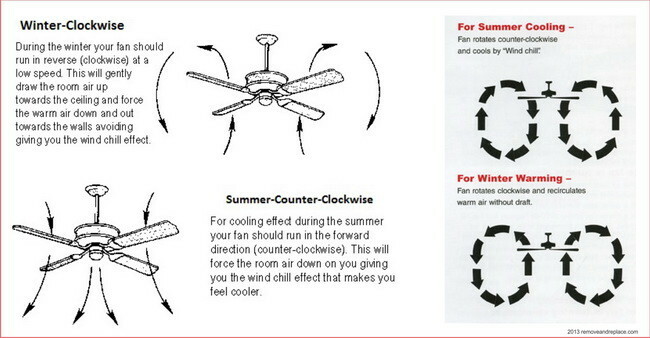 A ceiling fans blades turn 2 different directions (clockwise for winter and counter clockwise for summer) by setting the small switch on the fan housing. It is best to have your ceiling fan blowing downward in the summer when it is hot, and upward in the winter when it is cold. For the summer, it should spin counter clockwise when looking at it from below. In the winter, it should spin clockwise when looking at it from below. In the summer months you want the fan blades to be moving the air straight down to help cool you off and to mix the air in the room from above. In the winter months, you want the fan blades to be moving the air upward to help mix the warm air and so the fan is not blowing directly on you. If you look at the angle of the fan blades while the fan is on, you can tell which way the air will be moving, up or down. So for example, the spinning fan above is set for the summer months as it is turning counter clockwise to blow the air downward. A programmable thermostat is under $20 dollars these days and mostly anyone can install one. In the winter months, program the thermostat to keep your home at a constant livable warm temperature and set it to change during certain hours while you are not at home. Do the same in the Summer months to keep your home cool while you are at work. In the Summer, when you are not home, program the thermostat to keep your home reasonably cool. Turning the A/C completely off while you are gone and then back on when you arrive home will use much more energy. In the summer, try to use the oven, washer, dishwasher and dryer late at night. Appliances create heat when they are being used and running. Running your clothes dryer when it is 100 degrees outside will only make your air conditioner have to run longer therefore making your electric bill higher. In the winter, go ahead and cook on the stove or in the oven more than ever. The stove and oven create lots of heat so feel free to cook more in the winter to warm up your home. Use the most energy efficient bulbs possible. Certain types of light bulbs give off more heat than others. Fluorescent bulbs create the less heat so in the summer time it is best to use these. Fluorescent light bulbs also use about 50% less energy than regular light bulbs so switch out the old with the new. Some of the new energy efficient bulbs are much more expensive so do an online search for a “value pack” of that bulb to save money. Keep all of your computer type items plugged into one single power strip such as your monitor, speakers, computer tower, desk lights, etc. When you leave for long periods of time, switch the whole power strip off to turn everything off to save electricity. You can also do this for everything in your home entertainment system such as TV, DVD player, surround sound, game consoles, etc. Switching the power strip off will save you on your electric bill. It will also keep your home cooler when everything is off as they cannot generate heat. If your air conditioner’s air filter is dirty, the air conditioner cannot properly get the air it needs to properly cool your home therefore using more energy and increasing your electric bill. So in the summer months change your air filter every month to maximize efficiency and to remove dirt from the air. Changing filters also applies to changing your furnace heater’s air filter in the winter. Weather strip all of your windows and doors to keep the warm or cool air in your home from escaping. This will also help to prevent to cold or hot air from outside from entering your home. You do not have to be a pro DIY expert to install weather stripping. It is also very cheap and comes in big rolls that is as simple as applying a piece of tape. Weather stripping has 2 sides, one part is sticky with an adhesive and one is a foam material that prevents air flow. Close your blinds or drapes in the summer to prevent more heat from entering your home. Open your drapes or blinds in the cold winter months to let the sunshine in to help warm your house. 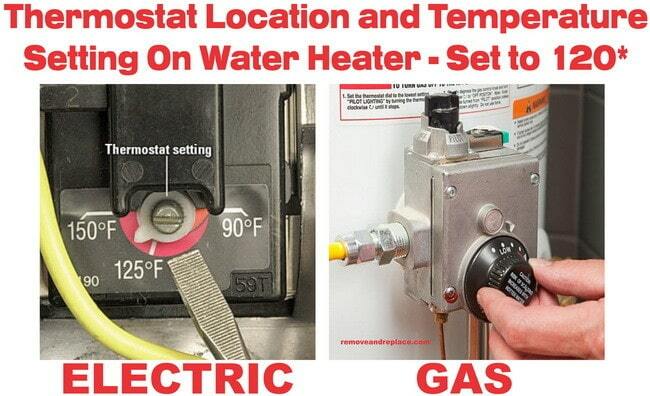 There is a thermostat on the bottom portion of your water heater. Sometimes it may have been set too high. If it is set at a high temperature your water heater will heat the water more often than needed and raise your electric bill. Set the water heater thermostat to 120 degrees. This is the most efficient temperature setting and you will always have hot water available. If you find that after the 3rd person takes a shower that the water is not as hot, turn the thermostat up another 5 degrees and see if that helps. Ceiling Fan Direction – Which way should my fan spin in the Winter or Summer? Set your Water Heater Thermostat to 120 Degrees to save Energy.